Following on from my recent interview with Frozenbyte, we're giving away a digital copy of the Collector's Edition of Trine 2! Update: It's found a new home. You can see the lucky recipient's fan piece and the other submissions in this blog post. 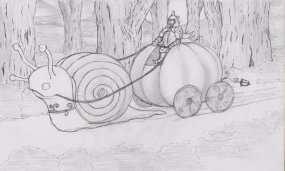 After a little deliberation, we've decided to hold a small fan art contest based on our favourite Trine 2 character: the Giant Snail! We'll give away a Humble Store gift certificate for the Collector's Edition (which is re-giftable if you want it for a friend) to whomever creates our favourite Giant Snail drawing/painting/sculpture (or any other form of visually appreciable art) by midday on Friday the 11th of May (UTC +10). Entries can be submitted as attachments in comments on this blog post, via email to contact@twolofbees.com, as tweets to @twolofbees, or as wall posts on our Facebook page. We'll announce our favourite piece and the lucky recipient in a blog post (if you're submitting via Twitter or Facebook, be sure to follow or like us so that we can get in contact with you! ).